December 7, 8 and 9 - Holiday Magic Is in the Air! ROSEMÈRE, November 27,2018 – Rosemère’s traditional holiday market and festivities are coming to the Memorial Community Centre December 7 to 9. Every year, hundreds of people join in the much-anticipated torch walk and browse the kiosks at the holiday market. Activities will kick off on Friday, December 7, with the torch walk, leaving from the train station parking lot at 7 p.m. Torches can be picked up between 6:15 p.m. and 6:45 p.m. Floats featuring Santa Claus and characters from the Paw Patrol will accompany the walkers along Grande-Côte to the community centre, where there will be music, dancing and live entertainment until 9 p.m.
“Every year, I’m delighted to see how popular the torch walk and holiday market are as a treasured holiday tradition for our community. 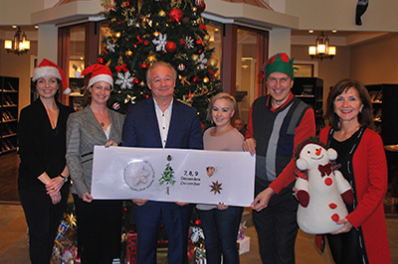 These three days of festivities are nothing less than magical!” said Mayor Eric Westram. Some 40 shops and artisans will be on site to help you get your holiday shopping underway and show your support for local merchants. Original gift ideas abound: home décor items, gourmet delights, arts and crafts, jewellery, clothing and more. The holiday market is being run by Etsy Laurentides. The three-day event is being held in partnership with Place Rosemère, the Aile des gens d’affaires de Rosemère and Jeunesse Action Rosemère. Thank you to them for their invaluable contributions. See the Town website for a full schedule.